The MET, a completely re-imagined office campus for today’s diverse and innovative workforce. A first-class, collaborative, amenity-rich workplace both indoors and out. This transformed office project offers a differentiated tenant experience and creates a sense of place unlike any other office campus today. With meticulously planned amenities and project-wide enhancements, The MET offers a balanced work and social experience, truly enhancing the daily lives of tenants and guests. The MET goes beyond the expectation of a traditional working environment; offering community, culture, entertainment, and an unmatched level of service for today’s forward thinking businesses. 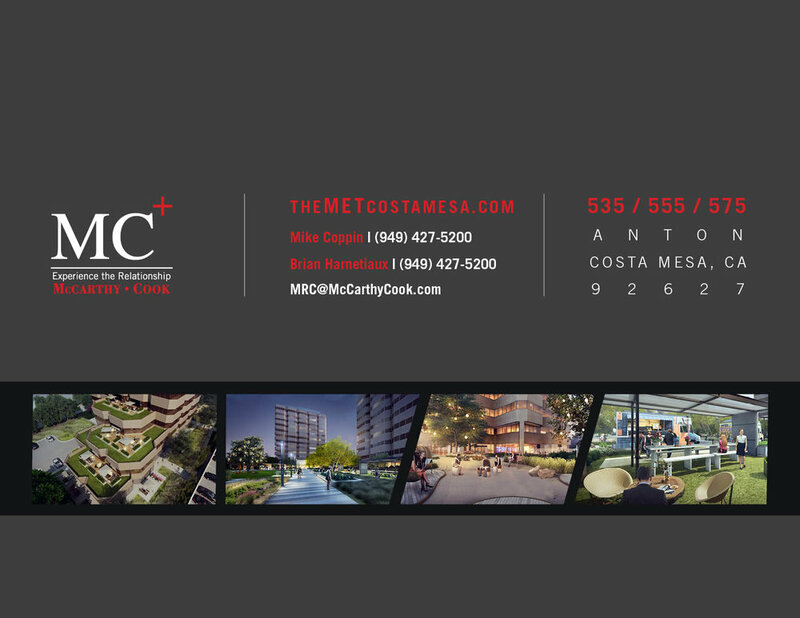 Located in Costa Mesa, The MET is integrated into one of Orange County’s most authentic urban environments and is re-establishing itself as the coolest place to live, work and play. With numerous artisan restaurants, art galleries, shops and entertainment options, Costa Mesa is the cultural hub of Orange County.